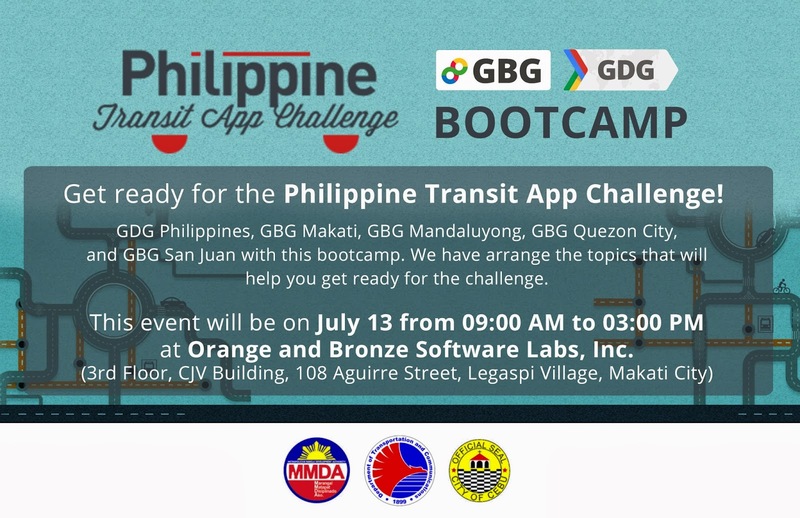 Last July 13, four bootcamp for the Philippine Transit App Challenge were organized by the different Google Developer Group and Google Business Group across the Philippines. There was a bootcamp in Cagayan de Oro City (organized by +GDG Cagayan de Oro and +GBG Cagayan de Oro), Cebu City (organized by +GDG Cebu) and Bacolod City (organized by +GDG Bacolod and +GBG Bacolod). In Manila, +GDG Philippines together with +GBG Quezon City, +GBG Makati, +GBG San Juan and +GBG Pasig organized the GBG-GDG Philippine Transit App Challenge Bootcamp in the Orange and Bronze Software Labs, Inc. office in Makati City. There were 30 attendees to the event with one team sure of joining the PTAC already. The event started at around 10:00 AM with Ms. Patricia Mariano from Department of Transportation and Communication (DOTC) discussing the objective of the challenge as well as the available public data from DOTC. Her presentation is available through this link. After the session of Ms. Mariano, +Pol Faustino from Orange and Bronze discussed about code management using Git. The users learned the basic of Git as well as the best practices on how to better manage their codes during the contest period. His presentation is available through this link. This was followed by a session by Camille Zapata, a freelance user interface and user experience expert, on quality user interfaces. One of the evaluation criteria of the challenge was quality interface, thus the attendees of the bootcamp learned what it means to have a quality UI. Her presentation is available through this link. During lunch, the participants used the time to ask their questions to the speakers. 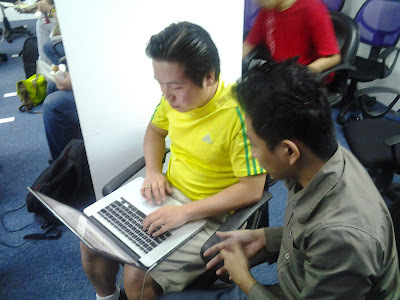 After lunch, +Edge Dalmacio, co-founder of Haybol.ph, discussed and demonstrated the power of Google App Engine. He showed how to deploy applications in GAE and discussed the pricing model. The last topic for the day is about tips and tricks on how one could promote their application. One of the evaluation criteria for the app challenge is public voting, thus, we invited social media guru and GBG Makati Community Manager +Rosario Juan to discuss with the developers the different ways they could promote their app. Note: we're still trying to upload the rest of the bootcamp. Thank you so much to all the participants who joined us in the boot camp and hopefully you create applications that would help solve the transit problem of the government. Thank you so much to all our speakers for sharing your time and knowledge in making this event possible. Lastly, Thank you +Orange & Bronze Software Labs for supporting our event in such short notice. After the 13th of July, the bootcamp was also organized in other key cities across the country: Zamboanga City (by +GDG Zamboanga), Baguio City (by +GDG Baguio and +GBG Baguio), Ilo-Ilo City (by +GBG Iloilo with +GDG Bacolod), Zamboanga City (by +GDG Zamboanga), Davao City (by +GDG Davao and +GBG Davao), General Santos City (by +GBG General Santos), and Bontoc, Mountain Province (by +GDG Halsema). With these series of bootcamp, the Google communities hope to inspire, motivate, and equip the participants with the right tools and ideas in helping address the transit problems of the Philippines.